Jones was born in Hawkinsville, GA. She began to exhibit her work 1927. She studied at Adelphi Academy in Brooklyn, New York, England and France, painting impressionist landscapes in Fontainebleau, painting in New Mexico of Pueblos and other Native American subjects. In 1936, in Georgia, painted expressionist works of black men and women. In NYC, she was President of both the American Society of Contemporary Artists and National Association of Women Artists. Personally and in her art, Jones was responsive to the problems of women as artists and in society. 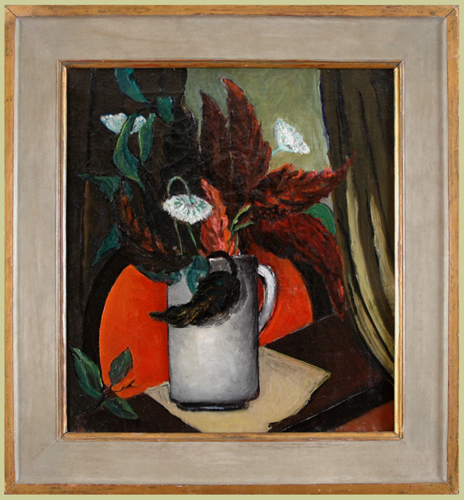 Her work was included in a 1999 exhibition at the Georgia Museum of Art of the University of Georgia, Athens: Before 1948: American Paintings from Georgia Collections. Markings Estate stamped on reverse canvas and stretcher. Comments The painting is in excellent condition and is in a period frame original to the painting.